Park your vehicle by the air dispenser. You will need to reach all four tires with the air hose. Remove the cap from the tire valve on the first tire. 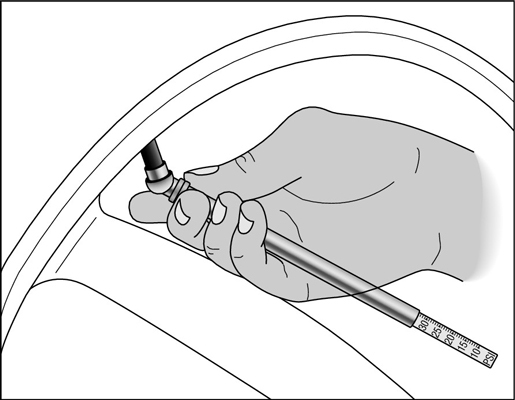 Use your tire gauge to check the air pressure in the tire. Air hose gauges at many gas stations are inaccurate. The pressure will have increased because driving causes the tires to heat up and the air inside them to expand. To avoid overinflating the tire, no matter what the second reading indicates, you should only add the same amount of air that the tire lacked before you drove it to the station. Use the air hose to add air in short bursts. Check the pressure after each time with your tire gauge. Keep checking the pressure until you get it right. Don’t get discouraged if you have to keep adjusting the air pressure. No one hits it on the head the first time!